Life is an endless list of questions, so I thought I'd clear my brain for the weekend. Please feel free to enlighten me; I'm trainable, I swear! What's the deal with "liking" your own post on Facebook? Isn't it a given that you are basically are on board and in agreement with what you want to post on Facebook? Does anyone really post a comment, and then crawl off to the corner in distress while moaning, "Oh, why did I write that? I just hate what I said! I hope everyone sees that I gave it the thumbs down!" Liking your own post is a bit of vanity; go read someone else's post. Build up their confidence a little. Which brings me to question number two: why is "like" the only option for Facebook? Someone will post an Amber alert and we're all liking it? Isn't that sending the wrong sentiment? Or are there people who are just not that crazy about kids? Another friend posted that she felt awful. A bunch of people liked that one, too. Facebook is trying to break up friendships and diminish English comprehension. Wikipedia reports that the like button indicates your appreciation of the content of the post...but it's, you know, ...Wikipedia. But I digress: Curse you, Zuckerberg!! While reading a news article on a case of animal neglect, the reporter described the scene in great detail, noting the presence of "fresh urine." Urine really isn't like produce; there's nothing fresh about puddles of urine. Just trust me on this one, no test run needed. If you are seeing it mid-stream or airborne, I might possibly pull back on my stance. I doubt it, though. There's talk of privatizing space. As in "Danger, danger, Will Robinson!" Space. Sort of like the company that bankrolled the Mayflower's voyage to the New World, there are companies that want to get on the planetary colonization bandwagon...er, bandrocket. Until there is a line forming right at the edge of Mars' atmosphere, I don't think we should worry about it. We're not at the oh-so-critical-save-me-a-place-in-line phase yet. A politician was being interviewed. In the course of the conversation, he bragged that his parents raised their large family on one income. Great, I thought...till he also mentioned the "bigger house" and the house at the shore. No one will pat you on the back for getting by on "just one income" if it is a huge, stinking income. We all want to get by on that, man. 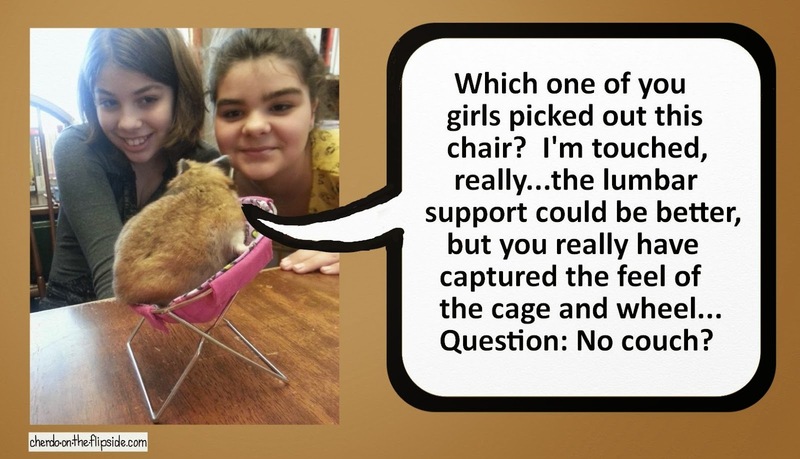 My granddaughter and a friend spent the afternoon trying out furniture for a hamster...or gerbil...some rodent-like creature. I've had a lot of pets, but it never occurred to me that I needed to worry whether or not they had - or liked - their chair. After all, I'm saving them from sleeping outside in the big scheme of things. I might have a big head about it, but there ya go. There's a company that makes houses from metal shipping containers, and Buzzfeed described the homes as "like Legos for adults." I beg to differ; that is only an accurate description if the adults have 158 metal shipping container houses, and they've stepped on them at least once. If you start any of your sentences with the phrase, "At the risk of being didactic..." - the cow is already out of the barn. You are taking the risk, and you ARE being didactic...like you didn't know, you devil. Have a great weekend and be safe, peeps! I'm Shady Del Knight and I approved this message. Good morning, dear Cherdo! I officially LIKE this post. It earns 5 smiley faces, my highest rating. :) :) :) :) :) I am one of the few stubborn holdouts on the planet who have not joined Facebook. My impression of it is exactly as you described - shallow and superficial. Blogging is an art form and you are one of its greatest practitioners. With regard to the privatization of outer space, I for one can't wait to see those golden arches on Pluto. The new company mascot will fit right in because he looks like an alien. Bring back Willard Scott! Hamster furniture is a booming business these days. My tip for you, Cherdo, is to pull all your money out of savings and invest heavily in hamster related stocks. It's a sure thing! That little fellow looks comfy, but where are his pipe, slippers and newspaper? Thanks for miles of smiles and have a wonderful weekend, dear friend! Once again, I am humbled. You are too kind - I am a practitioner who needs practice (always!). Thank you, SDK! As a transplant from more than one state, I like to see what people are doing and Facebook does make that easy. I'm just never sure why they are doing some things... Also, I've got three or four friends on the other side of the world and they are prolific FB posters with pictures. I confess I love the pictures. Space is the final frontier, but you just can't get a decent interplanetary Conestoga wagon these days. I wonder if the RV people are considering getting in on the race for space? Be safe this holiday weekend, and grill something, Shady! You've rasied some very good issues here. I disagree on the urine point. Fresh urine is urine that's recently been pissed out from the bladder. It's less concentrated than stale urine.